You may be saying to yourself what am I doing June 29th – July 1st 2018? The answer is: Babcock-Hovey Alumni Weekend. We are hoping to see you there this year. This year we are hoping to have great weather and planning many great activities. As a Paid Member of the Alumni Association you can come down and camp for free (Friday and/or Saturday if you wish), and you can bring your entire family for free. If it has been a few years we have many new improvements to many areas of camp. You may take the kids fishing at Pooler’s Pond, a beautiful walk down by the lakefront, or maybe some star gazing at night? As usual when you come down to camp we will feed you a bounty of food. So please join us for Alumni Day 2018 and have a great time. Special anniversaries for staff from 1998 (20th), 2003 (15th), 2008 (10th), and 2013 (5th) will be held. 25 year and 50 year milestones will be announced and celebrated. New this year Summer Camp will be in session Friday night so it is important to register ahead of time if you are planning on staying on Friday night so we can make sure to reserve you a bunk. Please RSVP to Matthew Crance at matthewcrance@gmail.com. NEW IN 2018! This will also be the Vigil Weekend for the Order of the Arrow Lodge. Great job of putting this all together. Hope we can get more photos and names One correction—the staff photo is from 1969 not 1968. The staff for 1970 ( no photo available ) is almost exactly the same as 1969. Dennis Macro–Camp Director 1968, 1969, and 1970. I love to be reminded of the years I spent at Babcock-Hovey!!!!!! Hi guys! Remember me?? Karl, who worked on the waterfront one year with Gar Ressing, than as assistant cook for 3 years to earn more money. I went back to BH last year with Terry Keller (big guy) from my kitchen days – they were still using the same pots!! I always looked forward to summer camp. I was a Scout first in troop 57, then in troop 52 in the 60’s. Then in the 70’s I was an Explorer Scout in the early 70’s. 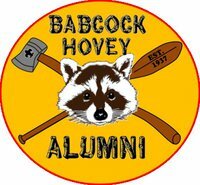 Spending time at Babcock Hovey was heaven to me as a young kid. I took every chance to be there, saved my money so that I could go every chance I got to. Winter camp at BH was great, too. Wish I had all the photos I took there of my friends, but they were lost in the many moves my job took me to. Hope the place lasts forever so other kids can enjoy it as I did.